From the New York Times bestselling author of The Wal-Mart Effect comes a fascinating journey into the secret life of water, a book that upends everything we think we know about the most vital substance in our lives. 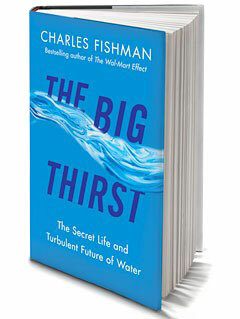 The Big Thirst brilliantly explores our strange and complex relationship to water. We delight in watching waves roll in from the ocean; we take great comfort from sliding into a hot bath; and we will pay a thousand times the price of tap water to drink our preferred brand of the bottled version. We love water—but at the moment, we don’t appreciate it or respect it. Just as we’ve begun to re-imagine our relationship to food, a change that is driving the growth of the organic and local food movements, we must also rethink how we approach and use water. The good news is that we can. As Fishman shows, a host of advances are under way, from the simplicity of harvesting rainwater to the brilliant innovations devised by companies such as IBM, GE, and Royal Caribbean that are making impressive breakthroughs in water productivity. Knowing what to do is not the problem. Ultimately, the hardest part is changing our water consciousness.